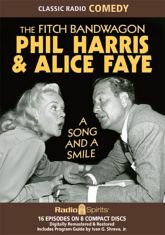 "Laugh a while�let a song be your style�" and enjoy radio's most outrageous comedy couple: Phil Harris and Alice Faye. They are off to a raucous start in these classic early episodes, co-starring Elliott Lewis as the unforgettable Frankie Remley! Stunts, gags, and over the top shenanigans are enabled by the diabolical delivery boy Julius Abbruzio (played by the delightful Walter Tetley). Cameo appearances are provided by Gale Gordon, Frank Nelson, Mel Blanc -- and the dashing Robert Taylor decides to fill in for an absent Phil�and sings "That's What I Like About the South!" Includes rare episodes, and a Program Guide by Ivan G. Shreve, Jr.